Why to conserve the Marsican brown bear? There could be many answers: for its uniqueness, for its aesthetical value, because it is an economical resource for the local populations, because of the law, for a matter of civility, for a challenge, but most of all because it is a species on the brim of extinction. The conservation of Marsican brown bear is a moral duty which we cannot and must not shirk as well as we must not shirk the duty to conserve biodiversity. What are the reasons at the root of this duty? There are reasons of eco centric sort (intrinsic value of the species) and of anthropocentric sort (use-value for the man), but the first kind of reasons must have an overwhelming weight on the second ones. The Marsican bear, like all living species, has the right to evolve according to the natural evolution time. Since life exists on Earth, all species evolve and the vast majority of them at some point has died out and the extinction is a natural process and an integral part of the evolution (for the mechanisms of evolution, see). When the extinction is accelerated by us humans (it is estimated that the current extinction rate is 100-1000 times higher than that of past geological eras), we face a forcing of a process which is the ground of life in its strongest and deepest core. The right to evolution is therefore universal and does not belong to Homo sapiens only. Human-induced disturbances are seriously breaking the spatial and time scale of the natural disturbances. Life on Earth was marked by great disturbance events (volcanic eruptions, meteorite impacts, climatic oscillations) that influenced the path of evolution of living beings. These events are occurring at a distance of thousands or more often millions of years between each other and randomly. The human-induced disturbances on ecosystems and ecosystem processes are much more frequent than natural ones and are made with extreme regularity or even continuously and on a massive scale (think of deforestation in the basin of the Amazon or Congo, think of the process of urbanization, the process of canalization of rivers in huge drainage basins). This violation of the time scale and spatial scale of the disturbance destroys ecosystems and with them the living beings, and, thus, is unethical for the reason of section 1. Resilience (i.e. the ability to regenerate itself after a damage) of the ecosystems with higher species richness. Although it is still a highly debated topic, many researchers believe, on the basis of experimental data, that ecosystems with greater abundance of species are able to maintain their performance in terms of processes more than ecosystems poor in species. Forcibly removing species from an ecosystem thus implies to make it more vulnerable and increase the probability of its collapse or irreversible transformation. So, it happens to interfere with the natural fluctuations of complex systems and the consequences of such interferences are nearly totally unknown to us. To meet a bear in a beech forest or follow the flight of an eagle with the eyes are phenomena that arouse emotion in man and enrich the spirit. Many living beings, with their ecosystems, are at the basis of several crucial aspects of religion and art, and have always accompanied man since his prehistory. The conservation of biodiversity therefore brings spiritual benefits to man. Economic value related to resources and services. Ecosystems have a huge – often underestimated by the general public – economic value related to raw materials and, in general, to the resources that they provide: when these resources are overexploited (lumber, fish stocks, soil) and no longer have the time to regenerate itself, the man is facing huge production downturns that generate strong social unrests and economic problems. One of the most important natural resources is, for example, the pharmaceutical use of plants and many other organisms: active ingredients, that led to the production of vaccines and drugs now essential to human health, were discovered just from living beings; to conserve biodiversity involves conserving other species currently unknown to us, but that could be useful in the future for new active ingredients. The ecosystem processes are at the basis of our daily life and our health: to stop these processes implies a severe damage to human economy and social life. The recreational value comes from the abovementioned spiritual value of biodiversity (the pleasure of seeing an animal or a landscape, the pleasure of walking in the silence of a forest, the pleasure of hunting a fox and so on) and from the fact that some people take economic advantage of this value; in fact, the hunter is willing to pay to get a hunting license, a cetaceans lover is willing to pay and go for a direct observation of whales, …). The main conservation measures are specified in the Action plan for the protection of the Marsican bearan (PATOM), a statement of intents and commitments between the Ministry of Environment, Regions and Authorities. The Action Plan by its very nature cannot produce any act having the force of law. To ensure that the measures provided in the Plan are implemented, they must be brought into force by a political changeover at a regional, provincial, municipal or protected areas level with the issue of laws, regulations, resolutions, ordinances and other acts having the force of law. Therefore, they are instruments closely linked to the political will of local and regional administrators even if the details of each measure must be defined by specialists in bear biology, ecology and veterinary sciences, environmental police, planning of protected natural areas. The four year long LIFE ARCTOS project, provides for the implementation of certain conservation measures that will eventually finish as soon as the European funds allocated in 2010 run out. Thus in 2014 the funds allocated for the conservation of the Marsican brown bear will amount at a Community and national level, as the Ministry of Environment has reported to us, to 0 (zero) euro. In the same areas, no access to motorbikes, quads and jeeps; providing for alternative areas for dry wood collection by residents for the preservation of the lumber civic use. To replace the braccata (hunting wild boar with packs of dogs) with other hunting systems less harmful to bears, such as the girata (only one dog called sleuth stalks the boar and leads it to the hunters); this measure must be implemented on the whole Marsican bear range, from Sibillini to Matese, not only in the ZPE (External Protection Zone) of PNALM. In solving out the problem of “confident” bears that tend to get closer to inhabited centres, to impede with adequate measures of protection and prevention the access to kitchen gardens, hen-houses, litter bins, illegal dumps and other potential points of attraction for bears; to train at least three teams of operators (technicians of protected areas, agents of CFS, rangers) that can intervene in real time in deterrence and driving away confident bears from villages. to improve the system of compensation for damages caused by predators by providing that the controls on the carcasses are always made by a veterinarian and ensuring that, in the case of some predation, compensation are issued by the appropriate authority (Park Authority, Province) within 60 days. Livestock farming in the Apennines protected areas is totally out of control and out of law: wild grazing at high altitude year round (even on rhamnus shrubs! ), Non-compliance with health law, absence of guard, prevention and protection measures provided by the law in force, failed disposal of carcasses, total lack of pasture planning and scheduling in accordance with the actual load capacity of the grasslands, the absence of herd registers and other; administrative and judicial controls are difficult to implement because they often lack appropriate tools (e.g. microchip readers, online access to the livestock records by municipal authorities, databases availability with a list of livestock enterprises) or conflict of interest among controller, controlled and political patronage. 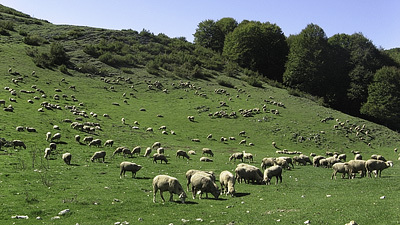 To reduce the interaction between livestock and bears we need a complete reform of the livestock sector through schemes and regulations established in a coordinated way by park authorities, municipalities situated in protected areas and ASL; in particular, it is necessary to prohibit wild grazing, planning shifts and rotation of pastures based on their actual load capacity calculated by using scientific methods, to control in a rigorous and strict way the health conditions of cattle and the regularity of farms (to this end, the staff of ASL, the rangers and the CFS shall be made able to work with proper tools) and strongly tighten sanctions, forcing the farms to take appropriate guard, prevention and protection measures, possibly subsidized by parks and municipalities. To put the canine stray under control at an over-municipal level through sterilization or catches. Activation of funds to municipalities and local health authorities in this regard. to encourage with regional funds, such as PSR, cooperatives and micro-enterprises that promote tourism with a low environmental impact, for example the opening of B&B in historic centres, the transformation of small livestock enterprises in educational farms, promotion of cycling and hiking. Throughout the bear range, to prohibit the opening of new quarries and new landfills in crucial areas for the bear. Also to prohibit the construction of ski-lifts, wind, biomass, hydroelectric and solar power plants above a certain size. The maximum permissible size must be determined by a special technical-scientific commission. To legislate at the regional level to prohibit the use of certain agricultural poisons throughout the bear range; to impose tougher sanctions and penalties for their illegal possession; to minutely control retailers and agricultural and livestock enterprises and make such controls public. To define much more effective communication and information strategies than the old ones, that have proved totally unsuccessful; on the basis of these strategies, implement a serious and rigorous programme of continuous information throughout the bear range, both inside and outside the protected areas, direct both to the general public and interest groups (hunters, farmers, beekeepers). To periodically evaluate the effectiveness of communication strategies and the perception of the bear from the public.